These guys haven’t aged a day since 2004 it seems. This upcoming holiday season, the sequel to one of the funniest films of the last two decades will reveal its fat face. This is a teaser trailer, so we don’t have any actual footage from the film, but we do get the Channel 4 News Team all talking to us about the film, and it’s nothing short of hilarious. I can’t wait to see this. 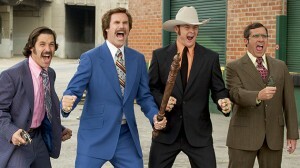 ‘Anchorman 2‘ is gonna be epic. Stay classy. This entry was posted on Sunday, May 19th, 2013 at 10:16 am	and is filed under Film, News. You can follow any responses to this entry through the RSS 2.0 feed. You can skip to the end and leave a response. Pinging is currently not allowed. « Fernando’s ‘Star Trek Into Darkness’ Review!!! I'm an immortal, sir, not a gazelle. How can we outrun this?